As promised. Here are a bunch of details from the last section. If you click on the picture you can make them really big. 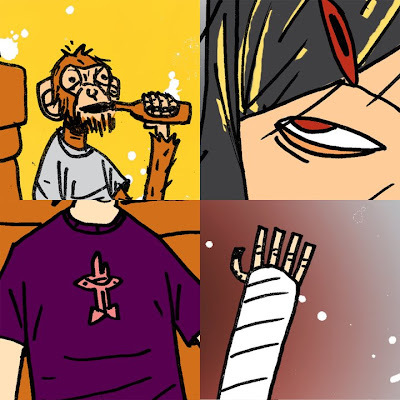 As far as comic updates. I finished writing sect 1.5 today. It was pretty short compared to all the other sections. Not nearly as much talking. I'll be starting on pages tomorrow. In other news. 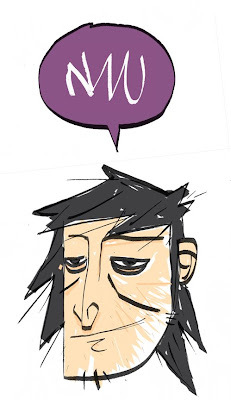 I've been approached to do another comic project. As for what this means for Northpark Underground, I'm unsure, but I'll keep the updates coming. I spent an obscene amount of time trying to come up with the look for Hot Eliza. Here are a handful (yes this is only part of them) of character sketches for Eliza. Even after all these versions. The final was still quite a bit different. Here is the final by the way. I'm actually fairly proud of myself for sticking this one out, and really getting an interesting looking character out of it. The pages I post online are pretty low quality, so I think tomorrow I'll post a bunch of images blown up to their full resolution (like the one above), so everyone can get a look at what I'm seeing while working. I've been introducing a lot of characters lately, and while I don't have immediate plans for them. I'm hoping they'll show up more in Chapter 2. Out of all the characters introduced so far none of them are really coming back in Chapter 1, but will most likely in Chapter 2. I still have a lot of backstory to tell in chapter 1. 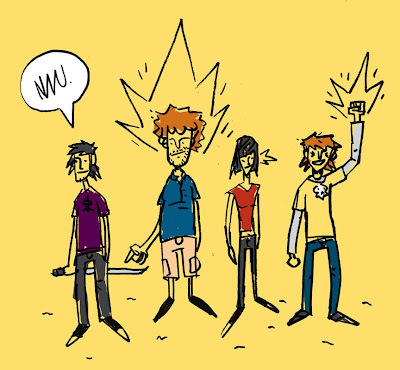 Chapter 1 is all about establishing the universe, and where the series is going. I think by the end of Section 1.9 or so you'll have a pretty idea of where the series is going. Also a week of straight posts! Who-REY! How about that. That hasn't happened in a while. Well technically it came out on time. It's still technically Friday. Hopefully the next section won't be released quite so late in the day. 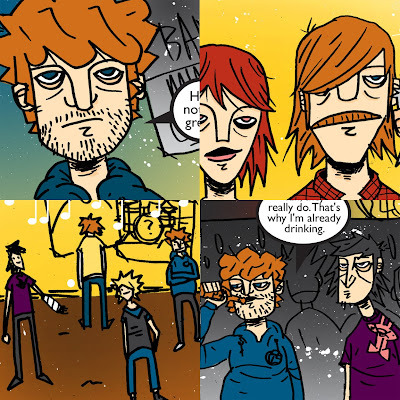 One of the things I really love about web comics is that I literally finished the section 20 minutes ago, and it's already up on the internet. Not a whole of mediums where you can do that and get away with it. Hope you enjoy. So when I first started my job, we were really slow. 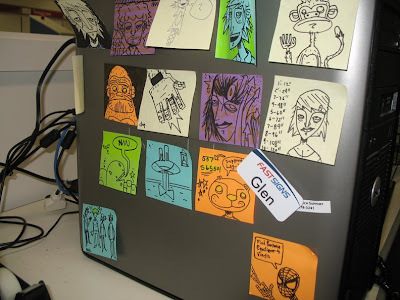 So to pass the time I doodled on Post-it notes, and stuck them on the side of computer. I threw a lot of them away, but I kept some of them. So this is what my work computer looks like now. Just a reminder. New section out Friday. 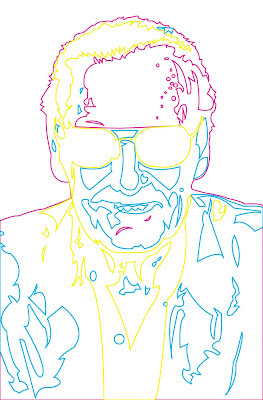 Here is the final version of the Stan Lee piece. And the series is now complete. Should be up on DeviantArt some time tomorrow. Edit: In case your new to the blog, or you just wanted to see all the pieces from this series again, you can peep the whole set HERE! Am I getting punked? Man I hate that. But seriously folks. I'm finally finishing my people you may know series. Here is the last one. 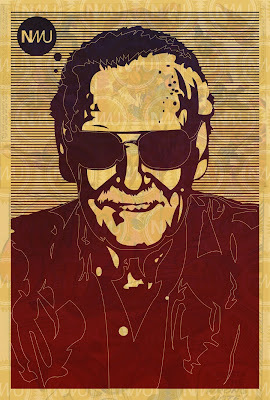 Stan "the man" Lee. Look for the final tomorrow probably (most likely over at deviantArt first). As far as comic news. 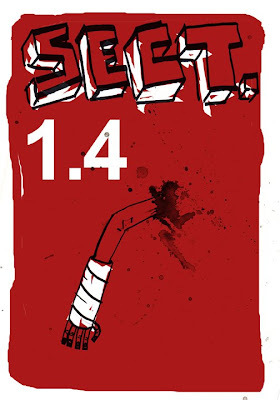 I've only got one page left for sect 1.4. And I've got some cool stuff for the blog in the next couple days. 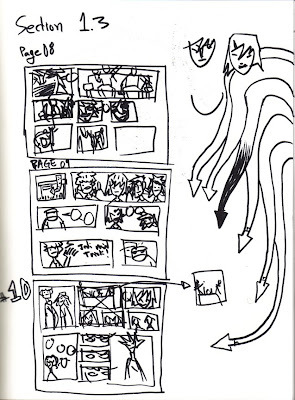 Here was the thumbnail page from sect 1.3. This weekend was the San Jose Supercon Comic-Convention. I met one of my favorite artists Sean "Cheeks" Galloway. I bought his artbook, and he did this awesome spider-man sketch in it. I've been a fan of his work for some time. 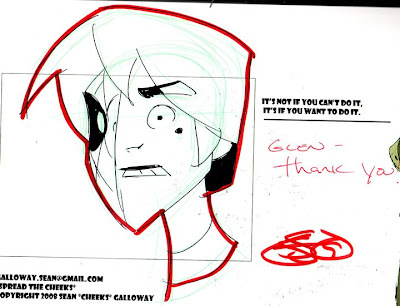 He was one of the first ever people I watched on DeviantArt. Do yourself a favor and check out his DApage. 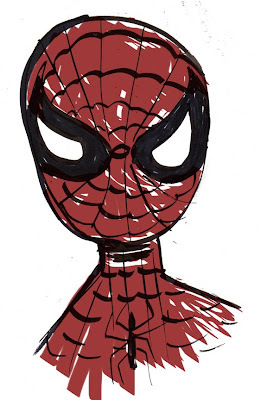 And just so this isn't all fan gushing, here is an uber fast spidey sketch I did. 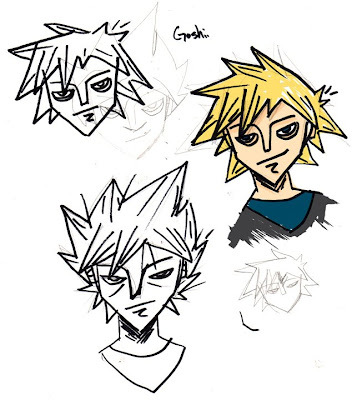 Here are the concept sketches for the DBZ styled character you see at the end of section 1.3. Based off a couple of different DragonBall Characters. I've been meaning to do a dragonball drawing for some time, but haven't gotten around to it, this will have to do for now. Another Northpark update. Well you might recall that in the last post I said something about not knowing where to go with the end of the chapter. Well, while i was writing that I came up with an idea, and then read a bunch of notes, and everything seemed to fall together, everything I had come up with for series neatly fell into place. I was having ideas and thoughts so fast, I couldn't even type fast enough to get it all on the page. After it was all said and done, I had already outlined all of Chapter 1, all 10 sections, and even started working on Chapter 2. I think each section is really going to be fun. All the things I wanted to put in the first chapter are in there. 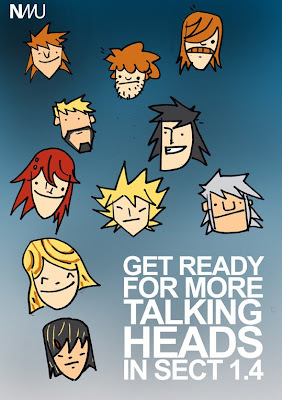 I can't wait to start drawing, so everybody can start reading where the series is going. 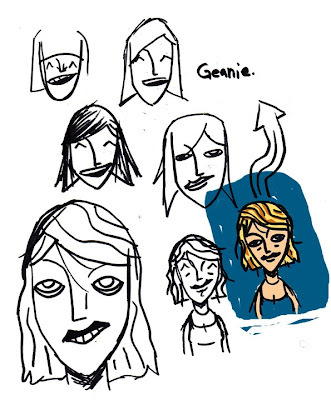 The concept sketches for Geanie's Character. The colored one was the final look I decided to go with. You can see a small panel with her in section 1.3, and she's in the piece from the last post. This may seem like overkill for a character that is one panel, but I assure you, she will definitely be popping here and there throughout the series. You'll see more of her in section 1.4 in fact. In other Northpark News. I've had a pretty slow week at work, so I decided to work on scripts. I wrote section 1.4 today, and did a lot of outlining, and plotting. I'm already plotted up to section 1.6, and started work on 1.7. I want to end the first section somewhere around 1.8, but I may go all the way to 10 sections. My only problem is I don't have an end to the first chapter. I know where the series is going, and where the next few sections are going, but i want a big ending to chapter 1. I'm going to have to keep thinking about that. Northpark Underground Section 1.3 is now up. Check it out. There is a slightly longer waiting period this time around. About two and a half weeks this time, and the next section is going to have about the same amount of time, and then I'll go back to the bi-weekly schedule. This last section took forever, and I want to make a little headroom, on this next section, so I'm not working till the last minute to get the section out on time. So enjoy this one, because it wil be a little while till the next one. Oh yah. HERE is a link to the new section. 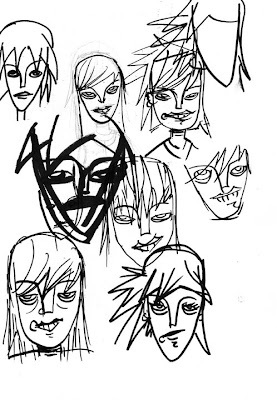 The group runs into a bouncer in the next section, and here were my quick sketches for the character. You'll see him in the next section.I'm thinking he will pop up here and there throughout the series. Here are a couple details from a page i just did. The blog kind of took a back slide the last couple of weeks, so I'm trying to get a couple good post in here. 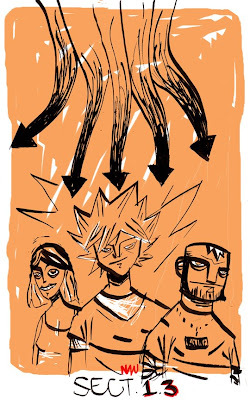 Here's a random sketch from the book of the same name. Checked out a ton of Scott Campbell's stuff. Thought I'd try do something in a similar style. 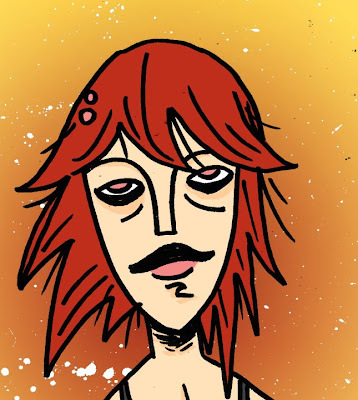 If you're interested in his art, check him out, he's in the blog roll now. 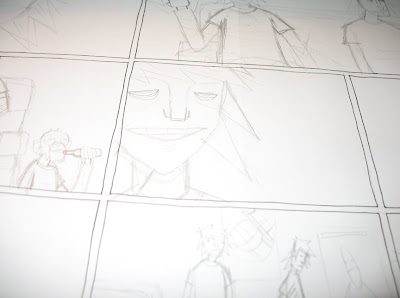 An Uninked Uncolored page from section 1.3.